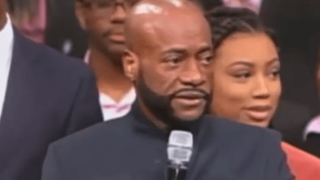 What's Ailing Bishop Eddie Long? I’m concerned about Bishop Eddie Long. In August of 2016, Long, senior pastor of New Birth Missionary Baptist Church, went viral after video showed that he'd lost an alarming amount of weight. He told his congregation that he wanted to live until 100 (!) and said that he would not get there “stopping by Popeyes. That was my weakness. The biscuits with honey and chicken wings, spicy. … I'm on the medicine that God gave you to feed your immune system to build you up. You know what? If you really want to move through this world and have influence, you gotta be spiritual and you have to walk by his commandments and you have to be healthy." He said that he’d committed himself to a diet of “raw vegetables” and insisted that he was not ill or on any medications. I didn’t buy it. He looked sickly, emaciated. There had to be more to the story. I am recovering from a health challenge that I trust God to deliver me from. It is unrelated to the eating-for-life diet, consisting of mostly raw vegetables, that I am continuing as part of a holistic approach to good health. I've been on a journey and just recalibrating myself, and like I said, I had some health issues and God has healed me. The manifestation is coming through, and we stand in that. When I woke up this morning, God expressed to me that there are some of you who suffer in this congregation of chronic pain. You have to be controlled by painkillers. If I'm speaking to you, jump in the aisle. There's a healing balm in here. He then had a healing service. In February 2006, during the funeral for Coretta Scott King, Bishop Eddie Long is shown seated next to the Rev. Bernice King at the New Birth Missionary Baptist Church in Lithonia, Ga.
All of this troubles my soul. I don’t know what ails Bishop Long. I’m interested in neither speculation nor gossip about his condition. On social media, I have seen people weigh in trying to guess his “health challenge.” Some have gone so far as to say that they do not think he will live long. I find that all distasteful and untoward. Indeed, the bishop has a checkered past that would raise suspicions about his secrecy now, but having grown up in the church and been in ministry for years, I understand why he might feel the need to withhold information from his congregation‚ because, let’s just be honest, black church folks are nosy—especially when it comes to the "passah." If the pastor buys a new car, they notice; if he buys a new suit, they may say he is too flashy; if he wears an old suit, they may call him raggedy; if she gains weight, they may call her too big; if she loses weight, they may say she think she’s all that. Put simply: There is no winning if you are charged with leading a black congregation. Sometimes it’s genuine concern that leads church folks to speculate about how things are in the pastor’s life; other times, it’s merely for the sake of gossip. That’s why I understand Long’s secrecy, his need for privacy as he deals with the health challenges he faces. Yet there is also an unrealized opportunity for spiritual edification. Too often, black Christians subscribe to what I call "magical thinking." Instead of addressing the real, existential causes of what ails them, they seek spiritual solutions. Broke? Don’t budget; pray about it. Overweight? Don’t make better health choices … pray about it. What's so dangerous about this line of thinking is that unethical preachers often exploit it for financial gain. You’ll find them on BET late at night peddling holy water for a small fee—and you’d be surprised by how many people fall victim to that kind of exploitation. That’s why, despite the nosiness of black church folks, I would love to see Bishop Long come out and discuss what ails him with honesty and humility. His “God delivered me” talk is fine, but discussing what he had to do to help that process might encourage someone who is dealing with a similar health challenge … because I’m sure he prayed, but I’m also confident that it took more than prayer if, indeed, he is healed. I wish the best for Bishop Long. I hope he is healed, and I hope that he continues with his healthy lifestyle. I also hope that he will consider opening up about the health challenges he faces—if for no other reason than to encourage someone else who may need more than just prayer.